Throughout its history Limassol was known as the city of fun and entertainment. One of the brightest annual events is definitely the Carnival. 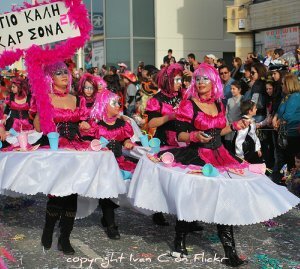 Although many cities and villages organize carnival events, Limassol hosts the largest and most colorful one in Cyprus. 50 days before Easter and 10 days before Lent on a Thursday. It is during what is called locally as Meat Week or Kreatini in Greek. This is the last week of eating meat before the Lent period. Festivities start with the Carnival King entering the city, decorated for the occasion. On Sunday the youngest participate in the Children’s Parade and then the Serenaders’ shows become the focus of the event. During the 10-day Carnival period many hotels and clubs organize fancy-dress parties. 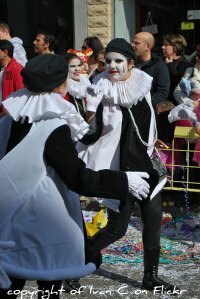 The Sunday of the second week of the festivities known as Tyrini (Cheese Week, when cheese and other dairy products may be consumed) is the climax of the Carnival. This is when the Grand Carnival Parade takes place. Colorful floats and groups of fancy-dressed people, singing and dancing, move along the Makariou III Avenue in Limassol. When Is The Limassol Carnival This Year? From the 21st until the 24th of February the Town Crier, will be announcing the beginning of the Carnival all around Limassol. The Limassol Municipality in collaboration with the Cyprus Photographic Society – Limassol Branch, will be organizing a Pancyprian Photographic Competition and Exhibition on the theme ‘Limassol Carnival’. Duration of Limassol Carnival Event: 21 February – 4 March. With the participation of the Ariones Choir and the Limassol Majorettes. The Limassol Carnival Event in collaboration with the Theomaria Art Gallery will be organizing an exhibition and a workshop on creating ceramic masques. The workshop will be held from the 1st of February to the 5th of March. The Limassol Municipality in collaboration with Ikepana Group will be organizing an exhibition on the theme ‘Carnival 2011’. Duration: 23 February - 2 March. The Georgalletos Serenaders’ Group participates. The Mayor of Limassol Andreas Christou will inaugurate the Limassol Carnival exhibitions. The Limassol Serenaders will be singing at Saripolou Square. The shop owners of Saripolou street invite you to a Carnival Feast. The Limassol Municipality co-organizes a Limassol carnival party with the student councils with music performed by a DJ. The Limassol Municipality in collaboration with the Limassol Union of Self-Educated Painters will be organizing an exhibition titled ‘Limassol Carnival 2011’. The Mayor Andreas Christou will inaugurate the exhibition. The ‘Queen of Amazons’ will be entering the town in a festive atmosphere on an illuminated float accompanied by the Limassol Serenaders, Ariones Choir, the Limassol Municipality Band, the Batucinio percussion instruments group, the Limassol Majorettes, the Mayor and the Municipal Council. The parade will initiate from the Town Hall at 7.00p.m. and will pass by the following streets: Archiepiskopou Kyprianou, Athinon, Anexartisias, Ayiou Andreou, Karaiskaki (Municipal Library), Stasinou, Andrea Drousioti and terminate at the Heroes’ Square where a party will take place accompanied by the music group, Ritmo Di Carnaval. Fireworks from the Town Hall start at 7.00p.m. Evening of serenades and carnival songs by the following children’s choirs: Student Orchestra of stringed instruments and the Choir of Papadakeion Municipal School of Music, Epilogi Music Workshop, the Gearmasogia Cultural Club Choir and Tsireio School Choir. The Limassol Antique Cars Club will drive around the city in a carnival mood. The Limassol Municipality in collaboration with the CUT and the radio station Choice FM 104.3 will be organizing a treasure hunt (for information and participation call 25820820). 11.00a.m. The Municipality’s train will be touring around the city. The Youth Choir Epilogi will be on board of the train singing carnival songs. Starting point: Limassol Co-operative Savings Bank (Gladstonos Street). 12.00 (noon) The Choir Tetrafonia of Limassol will be singing at “Pantopoleio” Restaurant at the First Municipal Market. 8.30p.m. A Carnival Ball will take place at Erma’s Auction Centre (48 Gladstonos Str). Fitidion Athletic Centre (close to the Municipal Zoo) All groups will be given participation diplomas. 6.00p.m. Serenaders’ Event at PERAMA with songs by Georgalletos Serenaders and dance performance by the dance school Alexastero. The event is dedicated to the memory of Giorgos Georgalletos. 7.00p.m. Serenaders’ Event at Hellenic Bank (Gladstonos 52) with songs by Ariones Choir, Limassol Serenaders and Monterni Keri Choir. Free drinks and snacks will be offered. 7.00p.m. Ariones Choir will be singing at the areas of Petrou & Pavlou and Ayios Georgios Havouzas.7.00p.m. Edon Serenaders will be singing at the area of Ayios Antonios. 7.00p.m. Giorgalletos Serenaders will be singing at Ayia Fyla. 7.00p.m. Limassol Serenaders will be singing at Zakaki. 7.00p.m. Monterni Keri Choir will be singing at the areas of Apostolou Andrea and Ayios Ioannis. People of all ages are invited by the Limassol Municipality to attend the event in disguised costumes and participate in different carnival spree with music and dancing. Carnival Costume Competition – Awards for the best three. 7.00 p.m. Serenaders’ Evening - Heroes’ Square Serenaders’ Evening with the participation of the following groups: Giorgalletos Serenaders, Monterni Keri Choir, EDON Serenaders and the Group of Cypriot Serenaders. Panos Solomonides Municipal Cultural CentreThe Dreams Choir and Elena Solea invite you to sing and dance to popular carnival hits, followed by a DJ. Carnival Costume Competition – Awards for the best three. The Group of Cypriot Serenaders will sing at Ayiou Andreou street & the Limassol Municipality invites you to a carnival feast. 10.00a.m. The Limassol Antique Cars Club will drive around the city in a carnival mood. From 5.00p.m. Georgia Protopapa’s Vocal Ensemble, Emmelia Choir and the choir Mousikes Periplanisis will be singing at the Grigori Afxentiou Square. Groups of Serenaders will gather at 6.00p.m. outside the Pattichion Municipal Theatre. At 6.30 p.m. they will start serenading, ending at the Grigori Afxentiou Square (District Office Building). The Limassol Municipality invites you to sing and dance with the Serenaders. The parade will begin with the Serenaders, the Limassol Majorettes, the Batucinio percussion instruments group and the Limassol Municipality Band, followed by the ‘Queen of Amazons’ and her entourage, floats, individuals and groups of carnivalists. All groups will be given participation diplomas. During the parade, former carnivalists will be honoured by the Limassol Municipality for their precious contribution to the Limassol Carnival. The Carnival will end with a grand outdoor Carnival Ball with carnivalists and music. Carnival Costume Competition – Awards for the best three. Fireworks start at 9.00p.m. Although this video is completely in greek, you don't need to understand the language to appreciate some of the visuals. The pictures of Old Limassol are wonderful!